Professional riding instructor and horse trainer, Chris Cervantes believes you can never be too old or too out of shape to be able to enjoy horses on some level. What can horses can bring to a person struggling with pre-diabetes? Good times and good health. Are you looking for a great way to keep in shape and bring that stress level down? Have you ever considered riding horses? Or, at the least working around them? Research shows that you don’t have to be an everyday rider to benefit from the substantial mental and physical health benefits horses can offer. It is not surprising that just about everyone who spends time with one, especially little girls, falls in love with horses. They are big, gentle animals who generally want to please, and love being smothered with attention. Anyone who tells you riding is not a great form of exercise because the horse does all the work is someone who has probably never ridden a horse before. Riding horses is a great form of exercise, burning plenty of calories. Even just an hour long casual stroll on horseback through the woods or park can burn close to 150 calories. If you ride a little harder, breaking a good sweat from trotting, cantering, or jumping you will burn plenty more. For most people who do this a few times a week, they find it is a great form of additional exercise in a really fun and exciting new way that gets them outside enjoying the fresh air. Finding an enjoyable activity is key in making exercise a long-term lifestyle change. Don’t Want To Ride? That’s Okay, Caring For Horses Is Great Exercise Too! In addition to burning calories and shedding a few pounds from riding you can also lose plenty from just working around horses and helping care for them. There are lots of things to do when it comes to caring for horses that do not involve riding. Between cleaning stalls, a decent grooming before and after rides, feeding, cleaning out paddocks, water troughs, maintaining fences, general barn maintenance, moving jumps — the list is endless – you can certainly find some activity you can enjoy doing that will help you get and stay in shape. Everything to do with keeping these big animals healthy requires daily work; riding is just a small portion of horse ownership. All the other things that go into proper care of a horse not only allow you to enjoy horses on another level, but if you’re looking to fit additional exercise in your schedule this is a perfect way to do it. If you have not been the most active person, you will notice a change from these other non-riding tasks alone. I know from experience working with five other people taking care of between 20-25 horses daily doing all of the above listed things I easily maintained a very lean toned shape just from these non-riding tasks alone. Just to mix things up a bit I still kept up running and swimming for fun, but just a few times a week. If you don’t plan to ride for whatever reason; health limitations, you are too overweight or too out of shape to start just yet, or perhaps you are a bit timid or not into riding but like horses and really want to get involved with them, you can still reap many of the health benefits horsemanship has to offer without riding. Even as a newbie into the horse world there are plenty of farms that would love to have someone help out around the barn – especially rescue organizations and local equine shelters. In every barn there are chores that always seem to get pushed to the back burner but need to get done and most would love the extra hands around the barn especially on weekends when they get so busy. Dealing with a chronic disease such as pre-diabetes can be stressful. Medications can have terrible side effects, including loss of concentration, mood swings, and can leave you feeling exhausted all the time. High levels of circulating insulin associated with pre-diabetes can cause insomnia, adding to an already stressed out feeling. Relaxing can be hard if you become too fixated on your disease, or its treatment. Another great thing about being with horses is that it can have a tremendous calming effect on the person. For those who are not intimidated by these big, kind animals, spending time with them is great way to unwind after a long week sitting in an office, dealing with the boss, cranky clients, and the phone ringing off the hook. Looking forward to being able to spend time with horses at the end of a long day or week gives you something positive to focus on which can help you get through the challenges of the day. It can also take your mind off dealing with medical problems because you know that riding or caring for horses will help you cope, get into better shape, and can help you take control of your physical and mental health again. Just being able to groom a horse, has a calming effect for the horse as well as the person. Grooming cleans the horse bringing up natural oils to the surface and allows for bonding time between horse and human. The close bond horses can form with people offers unique emotional rewards, especially for people who find it hard to trust or bond with other people. Horses are also great listeners and don’t judge people by their physical appearance the way some other people do — they just accept you as you are. Horses are great therapy for someone dealing with pre-diabetes or any serious medical condition because they can bring an overall balance in a person’s life and also have a positive effect on demeanor. They have a way of teaching us responsibility that makes responsibility fun; they trust and teach us to trust, and for riders they will teach you humbleness and humility. That definitely has a positive effect on a person for sure. Horses nowadays are seen as more of a luxury than a necessity for life so a lot of people won’t take the time to explore how to fit them into their busy lives. But if you are one of the people in the world considering how to get to enjoy them in some way whether it is owning, riding, or just being around them, consider yourself among the lucky because you are on a path to a healthier, happier life. Horses offer a fun, healthy outlet to kick back, relax, shed a few pounds and enjoy a piece of the “old days” that most people don’t get to. Chris Cervantes is a Certified Trainer through Meredith Manor International Equestrian Centre, graduating with high honors. 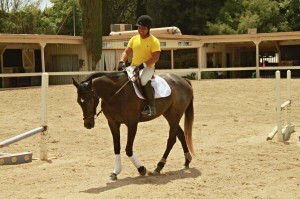 After training with FEI Dressage, Olympic Equestrian Pentathlon, and top Hunter-Jumper trainers and can currently be found teaching at Far West Farms in Calabasas CA. Cervantes loves killer whales and watching the “Today Show” with Matt Lauer. In his spare time, he enjoys reading, writing, and can be found kayaking in the harbor or lounging by the pool with a margarita. Can pre-diabetes be reversed so you won’t get diabetes?